How is it possible that summer's almost over? Didn't it just begin recently? Ugh, it's always such a whirlwind. And this was a busy summer for me, work-wise, so it definitely flew by. I know that in just a couple of weeks we'll be planning the last official summer cookouts of the season and getting ready to send the kids back to school and us back to full time work schedules. OK, if that's the case we need a plan. Easy, tasty meals, good breakfasts, on the go lunches and ready snacks. This particular bread has two areas covered in that it's a fantastic breakfast and also a great afternoon snack. I love making quick breads for the very reason the name implies - they really are quick. And they're super simple to put together so it's just a matter of what flavors I'm in the mood for. 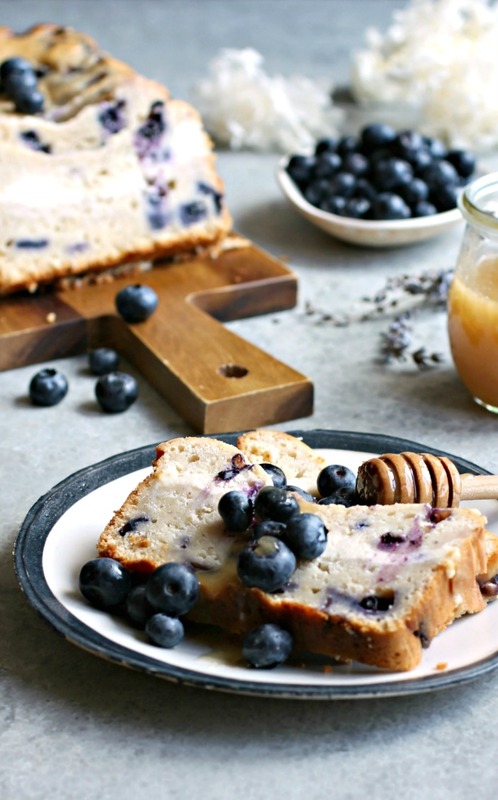 It's pretty easy to talk me into a blueberry bread but I decided to make this one a little heartier. Instead of serving it for breakfast with butter or cream cheese, I baked a layer of cream cheese right into it. I didn't make it overly sweet so that it would be a nice contrast in the middle of the bread. I also wanted to make sure it didn't get dry so I sweetened it with honey which helps retain moisture and gives food a longer shelf life. There are over 300 varieties of honey and I love experimenting but all of them give recipes a great warm flavor. In fact, I could totally see eating this for both breakfast and as a snack because...why choose? Enjoy! Add the eggs, honey and sugar to a large bowl and cream together using a hand or stand mixer. Beat in the butter, vanilla, Greek yogurt and lemon zest. In a separate bowl, sift together the flour, baking powder and salt. Stir the dry ingredients into the wet. 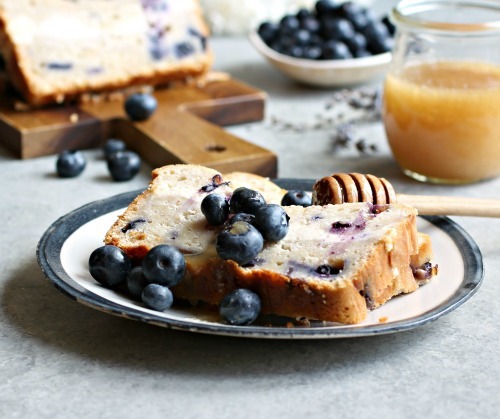 Toss the blueberries with a teaspoon of flour and stir into the batter. In a separate bowl, cream together the cream cheese, honey, sugar and salt until thoroughly combined. 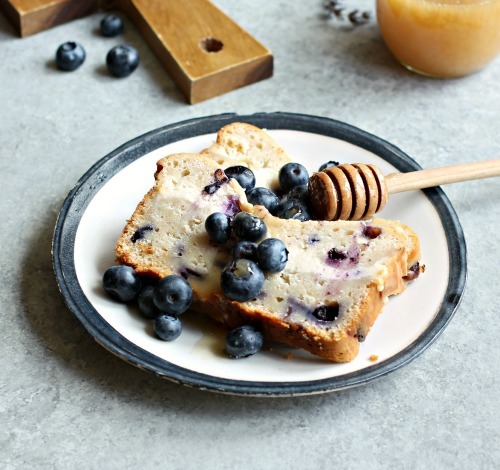 Pour half the blueberry batter into a greased loaf pan. Spoon on the cream cheese mixture, top with the remaining blueberry batter and gently swirl with a butter knife. Bake for 50 - 60 minutes or until a cake tester comes out clean. 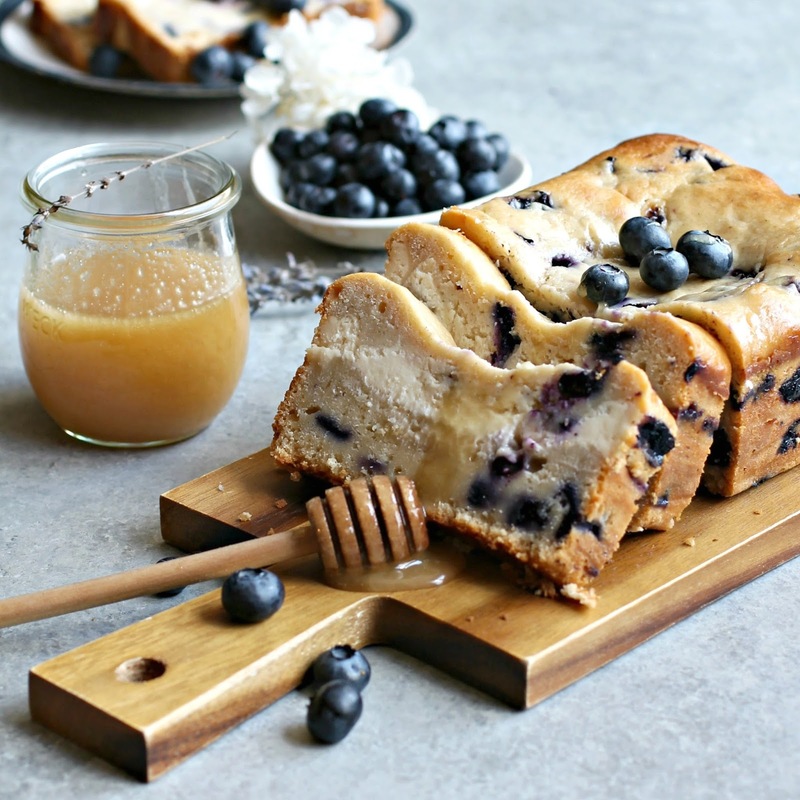 For more information about honey as well as recipes made with honey, visit the National Honey Board at honey.com and check out their Facebook, Pinterest, Twitter, Instagram and YouTube pages. 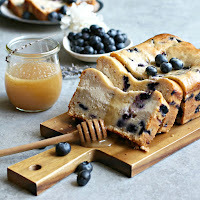 This recipe is sponsored by the National Honey Board. Thank you for supporting the products I love and use in my kitchen.